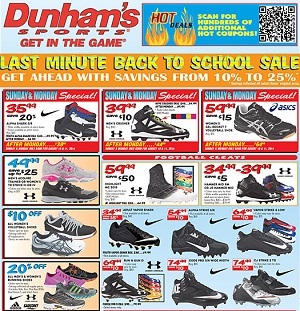 This week Dunham’s Sports weekly ad circulars, store flyer, deals and specials. Save with the Dunham’s Sports store circular featuring the best savings & promotions on sporting goods equipment, apparel and footwear. Check the latest weekly specials on: Adidas Hickory Backpack; Nike Men’s Air One Trainer; Under Armour Undeniable Crew Socks; Adidas Brazuca Glider Soccerball; High Timber Mens, Ladies or Girls Bike; Juice Plus Golf Balls; Intex 15×42 Easy Set Pool; Men’s Tps 2.0 Premium, Adams or Profile Golf Package Set; Razr X Black or Rocketballz Fairway Wood; Puma Amp Sport Golf Shoes; Courier Lite Golf Cart; Redondo Or Manhattan Volleyballs; Ultimate 100 Se or Sit On Top Kayak; Nordic Cross 14×14 Vacation Home Tent; Adidas F10 TRX FG Messi Soccer Cleats; Nike Men’s Huarache Pro Mid Metal Baseball Cleats; Spalding Super Flite Basketball; Cotton Graphic Adidas Logo Tees; Under Armour Men’s Flex Training Short; Champion Womens Jersey Capri or Pant; Adidas Madison Running Shoe; Nike Men’s Revolution 2 Running Shoe; Adidas F10 TRX FG Messi Soccer Cleat; Men’s Aeroline Athletic Shorts; Clarks Rattlin Deck Casual Footwear; Wilson Elite Player Ball Gloves; Adams Mens Package Set or Wilson Profile Package Golf Set; and more. Dunham’s Sports stores activate their latest weekly circular every Sunday. Dunham’s Sports is a full line sporting goods chain serving customers in 17 states, from Nebraska to Maryland. The company has over 200 stores nationally offering a full line of traditional sporting goods and athletic equipment as well as a wide variety of active and casual sports apparel and footwear.